Say what you like about Andrew Denton—just don’t accuse his documentary, God On My Side, of being anti-Christian. "I think that’s a misstatement," retorts the television veteran and interviewer extraordinaire. "It’s a film about some of the beliefs of Christianity, but it’s far too broad to say it’s an anti-Christian film." To be fair, God On My Side deliberately takes a very specific demographic as its focus group—one that’s not intended to be representative of Christianity in general. "Evangelical Christians make up 40 per cent of US President George W. Bush’s vote—they have the ear of the most powerful administration in the world," says Denton. "They’re part of the jigsaw puzzle of the clash of civilisations." "I would never suggest, and nor does the film attempt to, that they’re running US foreign policy, but it would also be disingenuous to suggest they don’t have a voice at the table. That’s why it’s relevant to look at them." 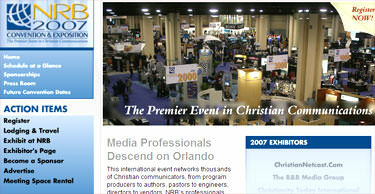 With that in mind, Denton and his production crew headed to the 63rd National Religious Broadcasters Convention in Dallas, Texas, where the delegates comprised some 6,000 Christian communicators. It was a predominantly evangelical, fundamentalist gathering, whom Denton queried not only about their personal faith stories, but also about how faith affects their perception of their world, their country—and their president. The responses, as seen in God On My Side, are alternately moving, baffling and infuriating. It’s difficult not to be affected, for example, by one man’s story of finding faith amid the carnage following the 1947 explosion of the SS Grandcamp, which claimed 576 lives. On the other hand, it’s hard to sympathise with viewpoints that blithely hitch faith to George Dubya’s warmongering bandwagon. "The thing that most surprised me was that everyone I spoke to believed George Bush is ‘God’s man’," says Denton. "It’s one thing to support him politically, or to like him, but to suggest he’s been put there with God’s approval is a pretty frightening concept. I have deep respect for people’s individual faith, but when faith gets connected to the machinery of state, or the machinery of hate, I find it very confronting." Equally confronting is the segment of the film dedicated to the “End Times” (i.e. the end of the world), which many of the talking heads believe is imminent. "A poll earlier this year showed that 42 per cent of Americans believe we’re in the End Times," says Denton. "The movie contains footage from a mainstream news story on CNN about End Times. All the major networks in America ran stories about Armageddon and End Times—serious stories in prime time." "That’s another reason for the relevance of the film: this is part of the worldview that is being heard at the table of the administration of America." God On My Side premiered at the Sydney Film Festival in June, and Denton reports that the response so far has been positive, from both the religious and the non-religious corner. "We had people come to the festival that had been at the convention in America, and when they saw the film they said, ‘That’s very fair’." "I think the people interviewed embody and believe they embody the Christian ideals of love," he adds. "But one of the points of the film is that absolute faith can blind you to the consequences of the actions you allow. It can tell you it’s okay to drop bombs on another country, or that it’s okay to hate a group of people such as homosexuals." "What I hope people will take away from the film is a clearer ear for the absolutes of faith," Denton concludes. "I think anyone, no matter what their faith, who says ‘There’s only one truth, I know what it is, and if you don’t ascribe to it you’ve got it coming to you’ … anyone like that needs to be looked at carefully." Great to read a piece with Andrew D, the most talented interviewer in this country, on the other side of the equation. I look forward to seeing the film. Thank you for producing God On My Side... the subject is extremely important when trying to understand US support for Israel, the manipulation of Rightwing Christians to support the US Oil industry, US/Aust/Israel attacks on the middle east and the basis for our multicultural society. Why are many humans prone to this mode of thinking (is it greed and selfishness?) and how do we manage to be civilised and rational in our dealings with each other while our thinking is bent by such (make sure that public education is available and strong as possible)? Seems that Hillsong is engaging in an advertising blitz... is this in preparation for controlling the Australian government elections next year? Mr.Denton just doesn't get it. As an unbeliever he naturally recoils at anything other than a separation of Church and state. Consistent , thinking Chriatians however cannot accept this view. Socialists are dishonest/blind/ hypocritical on this point as they have no problem thrusting their ethical standards on others. I am a huge fan of Andrew Denton; I find his intellect incredible! I was so impressed at his fairly well-rounded examination of this particular Christian group that I was disappointed to log onto this site and see that Andrew quotes in the above article that Christians "hate" homosexuals or find that it's "ok" to drop bombs on another country. I have just watched that entire film and not once did anyone say anything about “hate”. In fact, it’s just the opposite. God is about love, and Christians recognise that all men and women are made in God’s image, therefore we do not “hate” any man, but we may disagree with the things they do. As for dropping bombs – I also don’t recall anyone saying that this was “ok” either. I must admit, I am surprised about the level of support these evangelical Christians give to president Bush, but at no point did they condone the killing of others. In fact, they condemned the Muslim religion for killing those who do not believe what they do. When Andrew puts that TV producer on the “spot” during the credits of the film, he is given a great answer. We are thankful as Christians that we do not have to decide who lives and who dies – that is in God’s hands. So why, if we believe that God will come to judge the living and the dead, would we want to kill anyone? As for President Bush, and as a God-fearing Christian, I must admit, I’d never before looked at him as a man of God. But President Bush is no more powerful in this time than some of the great leaders in the Bible whom God either put to good use or to death. God will take care of President Bush according to his purpose. God would have his way whether America is “great”, or not. 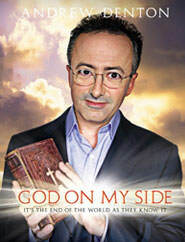 As Christians we consider that Andrew Denton's interviewing in 'God on my side' was excellent and impartial. The Palestinian Christian is an endangered species. When the modern state of Israel was established there were about 400,000 of us. Two years ago the number was down to 80,000. Now it’s down to 60,000. At that rate, in a few years there will be none of us left. When this happens non-Christian groups will move into our churches and claim them forever. Palestinian Christians within Israel fare little better. On the face of it, their number has grown by 20,000 since 1991. But this is misleading, for the census classification “Christian” includes some 20,000 recent non-Arab migrants from the former Soviet Union. So why are Palestinian Christians abandoning their homeland? We have lost hope, that’s why. We are treated as non-people. Few outside the Middle East even know we exist, and those who do, conveniently forget. I refer, of course, to the American Religious Right. They see modern Israel as a harbinger of the Second Coming, at which time Christians will go to paradise, and all others (presumably including Jews) to hell. To this end they lend military and moral support to Israel. Even by the double-dealing standards of international diplomacy this is a breathtakingly cynical bargain. It is hard to know who is using whom more: the Christian Right for offering secular power in the expectation that the Jewish state will be destroyed by a greater spiritual one; or the Israeli Right for accepting their offer. What we do know is that both sides are abusing the Palestinians. Apparently we don’t enter into anyone’s calculations. The views of the Israeli Right are well known: they want us gone. Less well known are the views of the American Religious Right. Strangely, they find the liberation of Iraqis from a vile dictator just, but do not find it unjust for us to be under military occupation for 38 long years. Inhofe must have got it wrong. Promises are being made to earthly Jerusalem that God did not make. The Holy Land was promised to Abraham, Isaac, Jacob and their descendants, as stated in the Bible. These are the Palestinian Muslims, Christians and Jews, who have been living in the land for thousands of years. The Bible never mentioned that God promised it solely to Jews. Anyone can be a Jew, but not anyone can be a descendant of Abraham, Isaac, Jacob and their descendants. James Inhofe and followers are unable to tell the difference between Jew, Israelite and Israel. There is a phrase for this. Ethnic cleansing. Prior to the 1967 war, the Christian youth at the Lutheran, Baptist, Methodist and other churches in Bethlehem used to pray and rejoice and have a good chat with hundreds of American Christian pilgrims. In particular Texas and California were two places from where many came to visit the Holy Land. Today only fading memories prevail. Bethlehem has been vacated by Christian families. The remaining Christians are paying the price by experiencing curfews which last for weeks. They remain sandwiched between Muslims and Jews without drawing the slightest concern from the many so-called Western Christians. So why do American Christians stand by while their leaders advocate the expulsion of fellow Christians? Could it be that they do not know that the Holy Land has been a home to Christians since, well … since Christ? Do not think I am asking for special treatment for Christians. Ethnic cleansing is evil whoever does it and to whomever it is done. Palestinian Christians - Anglican, Maronite Catholics, Orthodox, Lutherans, Armenians, Baptists, Copts and Assyrians - have been rubbing shoulders with each other and with other religions - Muslims, Jews, Druze and (most recently) Baha’is - for centuries. And we want to do so for centuries more. But we can’t if we are driven out by despair. We are equally frightened by those who commit suicide bombings. None of us Christians have condoned it or even contemplated the idea. Our commitment to Jesus’ teachings will never shake our resolve in this matter. American journalist Anders Strindberg makes a clearer conclusion. He says Palestinians are equated with Islamists, Islamists with terrorists. And presumably because all organised Christian activity among Palestinians is non-political and non-violent, the community hardly ever hits western headlines. Suicide bombers sell more copy than people who congregate for Bible study. What we seek is support: material, moral, political and spiritual. As Palestinians we grieve for what we have lost, and few people have lost more than us (the Ashkenazi Jews are one). But grief can be assuaged by the fellowship of friends. Prof Abe W Ata was a temporary delegate to the UN in 1970 and has lived and worked in the Middle East, America and Australia. Dr Ata is a 9th generation Christian Palestinian academic born in Bethlehem, and currently works at the Australian Catholic University. Thank-you for taking the time to write to us. But I must disagree with you on several points. First, there is simply no denying God's special relationship with the Jewish people...and with the land that God himself has deeded to them. And lest you argue that this special relationship has ended, please read Romans chapter 11...not to mention the frequent use of the term " forever" throughout the Old Testament promises made to Israel. I feel for those Palestinian people who are truly the innocent victims in this conflict. But the culprit is not Israel...it is the radical Muslim faction which hates Israel and the Jewish people and wishes to wipe them off the face of the Earth. Israel has been forced to take precautions such as the security wall to simply protect itself from the terrorists who live on their doorstep. My sympathies are with the truly born again Palestinian Christians...but I cannot disobey God's command to support the nation of Israel! Your correspondent speaks out of some very clear but unexpressed (and therefore untested) assumptions. These assumptions include a particular view about the nature of the Bible and the timeless significance of its contents. The most that can be logically said about the matters affirmed by your protagonist is that the Bible represents God as having a special relationship with the Jewish people, the land, etc. Or, perhaps better, that the mostly anonymous Jewish authors of the Bible claim that God has a special relationship with them. (As they would - and as others have claimed for their own people at other times. Even the USA has been known to speak in such terms about itself.) Such statements are factual descriptions and can potentially be validated or falsified. To affirm as axiomatic certain theological affirmations is not to make a useful contribution to informed discourse about the conflict in Israel and Palestine. Actually to state a preference for "truly born again Palestinian Christians" over some other category of Palestinians is simply to compound the silliness of the theological positions being avowed. A dispassionate and compassionate observer - no matter their religion or lack thereof - would first of all take seriously the obligation to listen to the human experience of the people suffering from this conflict. How sad that this person cannot pause his religious advice long enough to acknowledge the suffering you articulate. I wonder if he has ever been chased from his family lands and village by a foreign military power intent on stealing his land and even believing that God has given them the right to do so without any legal redress? If that were to happen he would doubtless understand the invaders' desire to consolidate their theft of his land by constructing a concrete wall (inside the small parcel of land on which he still clings to survival) in order to stop the terrorists from resisting the loss of their land. He would not object to the loss of his traditional water rights or grazing lands. And naturally he would be delighted to see settler-only roads criss-crossing the enclaves in which his people are forced to eke out their existence. 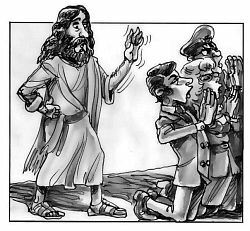 So far as I recall, Jesus preferred compassion over self-serving righteousness. PS: What is "AFN News"? Is it really "Armed Forces News"? Now that would be a dispassionate but highly credentialled source for biblical and theological analysis! Just from viewing Andrews programme , I was scared sh--less by some of the fanatical statements on both sides of religion, from both Christians, & Muslims. These people were absolutely convinced they were right in their beliefs, and that nothing else could possibly be true. What about evolution - science? tru or false findings? andrew denton was fantastic in this, he remained impartial and respectful .. but then again if he had have let his real veiws be known they may have crusified him then and there..
We watched "God on My Side" on Monday night and I can only congratulate Andrew Denton on carrying out a very fair appraisal of Evangelical Christianity and for being very fair in his interviewing. We met the McDuff brothers in the U.S.A. many years ago when they sang at the World Convention of the Full Gospel Business Men's Fellowship International. They had good answers to Andrew's questions. Andrew, you would have a great influence on many people if you were to one day proclaim yourself to be a christian. My prayer is that through something you have heard during the production of the film, that you will come to know Jesus Christ as your Lord and Saviour. Again, congratulations on a well presented documentary. It seems that Mr Denton is as blinded by faith in his political agenda, as evangelical Christians are by their religion. As an atheist, I am amazed by the things Christians believe. But I am horrified by the the things people with strong political beliefs are willing to accept (and what they're willing to turn a blind eye to). Somehow I don't think we'll see a sequel exposing the insanity of Islam. But a sermon entitled "CLINTON ON MY SIDE" is a distinct possibility. Andrew, if the quote in this commentary is correct, where do you get the comment about fundamental Christians hating homosexuals, and using Christianity as an excuse to drop bombs??? Christians are expressly called to love all, and this includes homosexuals, heterosexuals, prostitutes, elderly, people of all races.... it includes all. This does not mean Christians agree with all. Undoubtedly you do not agree with everything you see and hear. Does that mean you 'hate' everything/ everyone you do not agree with? If Christians have indeed said this, they certainly are not doing so with the approval of their God. The interview itself was just wonderful - showing up some of the weaknesses of Christianity as a religion made up of imperfect human beings, who are sincere in what they are doing, if not sometimes a bit unbalanced. God is bigger than all of our failings, and comes through anyway. He will always find those whose hearts are open towards him. Well Andrew ,it was an interesting insight into the Church and State in the US. I find it quit complex that a confessed "scoffer" or Agnostic/Atheist accepted the role of the commentator,although you did very well to sit on the other side of the fence. We can only know that the more you start knocking the Lord Jesus ,that you will fall even harder. One hopes you wont experience the plight of the apostle Paul. BTW : Did it hurt when you read the Bible during that film.? You have come a long way from being a complete Anti -Christian.! I am trying to track down the makers of the "personalised Bible" as seen on your show (God On My Side) when you went to the convention, a woman was selling bibles that were printed with the readers' name injected in it in place of the 'you, thou, thee, ect.. please help me if you can. I thought the documentary was very interesting and well put together, but as a christian myself, I would really love to see a documentary on what it means to be a 'normal' christian..let's show the public what it's really about rather than just the extreme minority! Like many other doco's, it seems that people tend to focus on the extremist's point of view, rather than the 'average' point of view. I understand that the christian evangelical fundementalists make up a large part of the US, but what about the christians in general, particularily those in Australia..why go abroad to find out about christianity? There is a 'normality' to christianity that is rarely shown to the public and it's no wonder most non-christians think we are all a bunch of crazy nutters! I would think that too after seeing some of the people in Andrew's film! There are extremists in every facet of life, be it religous, business, political, social...and the media tend to focus on them rather than on the general consensus. The public always remember the extremists (and who wouldn't) and they make their judgements based on this smaller percentage of people and their 'way out' thinking, than on the majority. Unfortunatley as a result, us normal christians then get stereotyped under the same umbrella and tend to be labelled as 'crazy, fanatical, judgemental, narrow-minded, self-imposing, self-righteous, christian biggit fanatics.....and the vast majority of us aren't like that at all!! It's always the way I suppose, the loudest, strangest people draw all the attention, while the quiet, normal, everyday God-loving people get ignored. I guess the loud and strange make for better viewing...but it is certainly not what is 'normal'. It is such a shame, because I believe there are so many people out there who's views have been tainted by seculalr cultures view on christianity and the way in which is has been misrepresented. Richard Dawkins did a doco from an atheists point of view 'Faith - The root of all Evil' and again, he used the most extreme religous points of view to make his case seem more feasible...if he had interviewed and researched the 'norm' rather than the ridiculously extreme, he probably wouldn't have much to say! To comment on what ava said regarding christians being 'absolutely convinced in their beliefs' and how frightening that is....don't we all, christians and non-christains alike, have absolute beliefs? I really don't see what is wrong with having an absolute belief when the proof is there. You also mentioned 'What about evolution and science'...those people also have absolute belief in what they think to be true...do you find them frightening too? Richard Dawkins has an absolute belief in his theory of evolution and science, or is that okay because he is not a christian? We are all entitled to our viewpoints and all deserve respect from one another. I completely agree with Hannah B too...us normal christian don't hate anyone...If you look at the type of people Jesus helped in his time you will see how compassionate and non-judgemental He was and is...he opened his arms for prostitues, peasents, the sick and thoses with major troubles in their lives...nobody is below or undeserving of God's love..we are all created equal and God loves every single one of us regardless of what we do or the choices we make. We are not perfect and God knows we never will be but He loves us anyway! Any person who claims to be a christian and hates someone based on their lifestyle choice has got it wrong...we may not condone thier choices but we don't hate them....who are we to judge anyway...as I said, we are by no means perfect. Christians and non-christians alike...we are all the same! !..we are imprefect, mistake-ridden, normal human beings. The only difference being that as a christian I know where I came from and who to be thankful to and as a consequence I try to live my life in a way that shows Him just how thankful I am and how much I love Him. It is so refreshing to see such an insight to the political/religious nature of America, which is not from the religious point of view. I congratulate Andrew Denton for such a beautifully done piece of film. For the people who say that some Christians at least are not blinded by faith, have a look at their picture of George Bush. Is it not obvious that this buffoon should not be anywhere near the President's seat. People voted for him because they thought he was led by god? I mean come on! The guy led his army into a country looking for weapons of mass destruction, wow they sure hid them well! I believe that this was a brilliant film which should be remembered as one of the best social/Christian films of our age. WELL DONE DENTON! It seems that much judgment passed about Christianity and Christ/God Himself is based on the perceptions we have of select Christians. Please, do not look to George Bush nor even Dr Martin Luther King Jnr for your perception of Christ! Look to the man Himself. Who were the people He accepted as His followers? Prostitutes, outcasts and the poor. Look at Saul/Paul and Simon the Zealot, we would call them terrorists today! Yet He loved them and forgave them. Christ is love and forgiveness. He does not hate homosexuals and does not condone bombing of other nations. He does not hate muslims. As I write, thousands of muslims are running to the loving embrace of Christ, because they know He loves them. Forget George Bush, fundamentalists, hymms and everything you know about Christianity. Look to Christ in the Bible. You will find He loves you too. andrew denton is biased. focusing only on a small minority doesn't necessarily mean the larger population of christians are televangelist militants. The situation of children who experience not just a generation gap, but also a distance from parents whose migrant inheritance includes a "million scruples that made no sense". Poor McDonald’s. First, the 2002 doco Supersize Me came along to remind people that, yes, fast food is really bad for you. This year Maccas is on the defensive all over again.